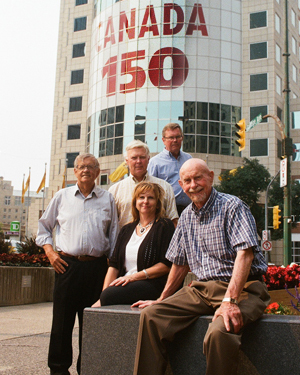 The board and staff during Canada’s sesquicentennial (l. to r.) Frank Wiebe, president; Bev Klym, administrative assistant; Robert Martens, vice-president; David Anderson, vice-president finance; Hugh Arklie, executive director. The number of grants awarded in the past year was unusually small. In recent years the Foundation averaged 94 grants per year, a number that fell to 74 in the current year. However, the dollar amount of awards totaled $1,288,630, a sum that exceeded our annual averages. The Foundation embraces the entire Province of Manitoba as its constituency. Grants made in Winnipeg numbered 38, and in rural and northern Manitoba 36 grants were awarded. By dollar amount Winnipeg agencies received 37.8%, and rural and northern agencies received 62.2%. The swing in the dollar amount was once again largely caused by our support for rural community foundations and Youth-in-Philanthropy programs. Also, this year saw an unusually large number of rural projects sponsored by Winnipeg agencies. Many agencies that are headquartered in Winnipeg conduct their activities in rural and northern Manitoba, as well. It has been our pleasure to participate in this philanthropic cross pollination with the Manitoba Arts Network, the Salvation Army, the Canadian Centre for Child Protection, Muscular Dystrophy, Macdonald Youth Services, Kids Help Phone, Bookmates, the Manitoba Historical Society, Manitoba Theatre for Young People, the Lake Winnipeg Foundation and Career Trek. In the past year, we have been thrilled to work with these and many other fine agencies. 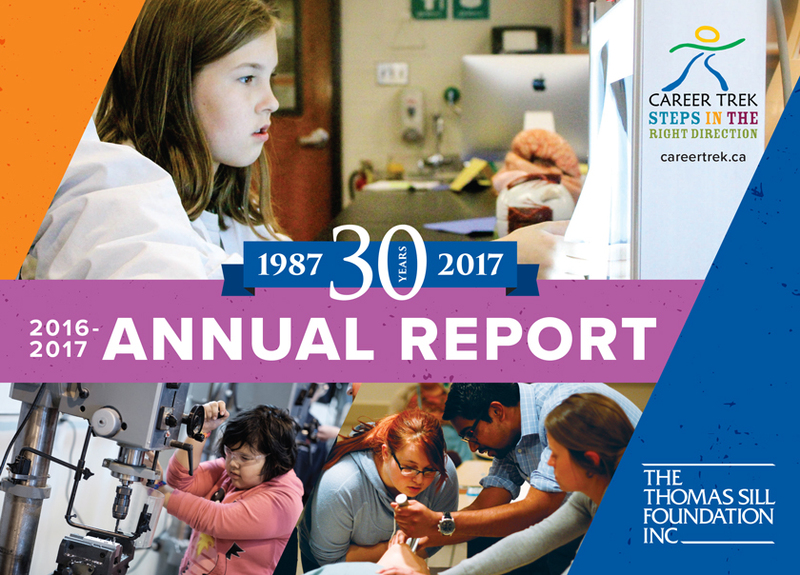 To emphasize the impact of Winnipeg-based agencies throughout the province we have chosen to reflect Career Trek on our annual postcard, and as the feature grantee in our annual report. Career Trek’s unique methodology (www.careertrek.ca) has secured a future for thousands of children in Winnipeg and rural and northern Manitoba who likely would never have completed school, much less aspired to a career. Regular readers of our annual reports will know that the Foundation embraces special projects (Programs/Projects) in pursuit of its mandate to serve all Manitobans. The second phase of the Lake Winnipeg Project was fully funded. Research on the state of the lake is conducted by the Lake Winnipeg Research Consortium. It operates two vessels as research platforms and its costs are high, despite rigorous attempts to keep them affordable. The Foundation and its partners raised $112,500 in the project’s latest phase to help fund the Consortium’s administrative costs, always a challenge for fundraisers. Also in our 2016-17 year, the second phase of the Community Foundations of Manitoba was completed. All of Manitoba’s rural and northern community foundations were challenged to raise $50,000 in 18 months, and were rewarded with up to $25,000 upon success. We are pleased to report having issued cheques totalling $1,095,987 to 49 foundations, an 89.5 % success rate. After some years of inactivity, our Youth-in-Philanthropy program was restarted with 13 rural high schools participating. Upon completion of this project’s second phase, 3 years hence, it will have funded 13 Youth Advisory Committees with $136,500. 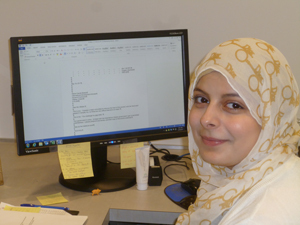 A highlight of the year was the internship of Hanan Akra. Hanan is a refugee from Libya. She worked at our office to improve her English, computer and administrative skills. Her plan is to become employed in an office setting while studying to acquire professional skills. She is a delightful young lady, and we wish her all the best in her new country. Finally, happy 30th birthday to the Thomas Sill Foundation! It has been our privilege to be a member of Manitoba’s philanthropy community since July 13, 1987. And it has been my honour to be the executive director of the Thomas Sill Foundation for all of those wonderful 30 years. I will miss my colleagues in the philanthropic sector. Keep up your good work; you are the spice of our society! Call me sometime – Bev has the number.